The flagship toy in Jakks Pacific's new SpyNet line is the Secret Mission Video Watch, a piece of wearable tech that lets spies-in-training covertly record video and audio and upload those sensitive materials to a secure website for further analysis. For my generation, Macaulay Culkin's use of the Talkboy in Home Alone 2 was the single most glorious realization of usable spy technology that we had ever seen. Following in its lineage, the chunky SpyNet watch—no, I don't have baby hands—actually gives kids real spying capabilities: the ability to shoot up to 30 minutes of video, 2 hours of audio, or 2000 pictures with a built-in camera for playback on the watch's color screen. OK, it's not going to be HD-quality, "enhance, enhance" type stuff, but from the demo I saw, the recorded footage is definitely good enough for some low-stakes familial blackmail. Your kid won't quite be James Bond, but he won't be the goofball from Get Smart either. Anyway, the fun doesn't stop at the wrist—the watch interfaces with a proprietary website that will allow kids to transfer their files online via the watch's mini USB port and securely review their files online. There they can run lie detector software and video analysis, or download specially-tailored missions for use with their SpyNet watch. The USB port also allows for the addition of accessories, like the SnakeCam for recording audio sneakily around corners. 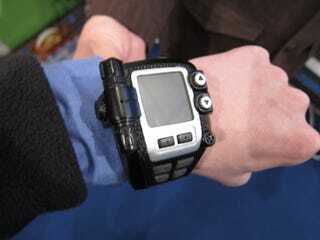 The watch will be available later this year for kids who are ready to do some real spying. Or for grown-ups who can't bring themselves to order real, professional quality spy gear. Toy Fair is the annual event where we get to completely regress back to childhood and check out all of the awesome toys coming out for the rest of the year. And well, we love toys.